Zealous Records and Soul-Sides.com are proud to announce the second volume in ground breaking, collaborative series: Soul Sides Volume Two: The Covers. Set for release on May 22nd, Volume Two is the next edition in the revolutionary series that birthed the first pairing of a traditional record label and a new music blog. 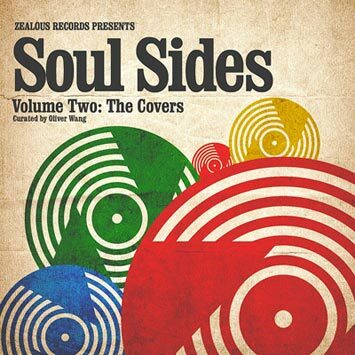 Oliver Wang, Soul-Sides.com`s prestigious host, has scoured his archives to curate another impeccable collection of rare soul music, this time featuring exclusively cover songs. Giving equal attention to the known and the unknown (both towards artists and tracks), each cut is a testament to the power of soul music. Al Green`s legendary version of The Beatles "I Want To Hold Your Hand", Sharon Cash`s bombastic version of the classic "Fever", obscure funk group West Coast Revival`s interpretation of Dave Mason`s iconic "Feelin` Alright", a heartbreaking rendition of Gil Scott-Heron`s "Home is Where The Hatred Is" by Esther Phillips, even Afro-Beat revivalists Antibalas` take on the Latin hit "Che Che Cole" all grace Volume Two. In a sly twist on the expansive nature of a covers record, the album offers a bonus track "What A Man" by Laura Lee, the original of which appeared on Soul Sides Volume One. In the summer of 2005 Zealous Records approached Soul-Sides.com with the idea of having a music blog curate a record. "I was curious how much sway blogs had in musical communities. It had never really been done before and I had no idea what to expect", said Zealous head Kevin Drost; "On a whim we named it Volume One, just in case it was a success". Now in its third pressing, Volume One went beyond what anyone involved could have predicted. Paper Magazine called it "Essential", Wax Poetics said, "It needs to be heard", and the SF Bay Guardian stated it would "please everyone from the geekiest aficionado to my Cantonese-speaking dad". The album was heralded by everyone from Pitchfork to The Wall Street Journal. That success was due entirely to the impeccable taste of soul-sides.com`s host: writer, DJ and educator, Oliver Wang. Wang has been writing on music and popular culture since 1994, his writings appear regularly in NPR, LA Times, Village Voice and others. He created Soul-Sides.com in 2003 and quickly built it into one of the most lauded audioblogs on the net. He is now an Assistant Professor of Sociology at CSU-Long Beach, after completing his PhD in Ethnic Studies from UC Berkeley. With Volume One in stores, Wang and Zealous Records began the arduous process of pairing down over 50 tracks into the 14 that made the cut. The tedious procedure of tracking down content owners and acquiring rights took nearly a year. The end result, Soul Sides Volume Two, represents not only a must have collection of rare soul, funk, and R&B, but also a milestone in new media. Volume Two is hard proof of the cultural and economic impact of the new audioblog medium. Zealous Records Presents Soul Sides Volume Two: The Covers is the next step in what is becoming a storied and illustrious musical anthology.